Given that Google is adding mobile-friendliness as a ranking signal, this morning’s SMX West session on mobile search is packed. Everyone is eager to hear insights directly from Google when Webmaster Trends Analyst Gary Illyes takes the stage to talk about the update and answer questions from the audience. In addition to Illyes, the audience will also hear from Mitul Gandhi, chief strategist at SEO Clarity, and Bryson Meunier, Director of SEO for Vivid Seats. 1) Google’s Gary Illyes revealed that there is a Google team dedicated to indexing mobile sites separately – and the separate indexing of mobile sites is something Google might experiment with in the future. 2) April 21, 2015, by all accounts, is a “very important day.” That is an exact quote from Gary Illyes. Read on for the full scoop. 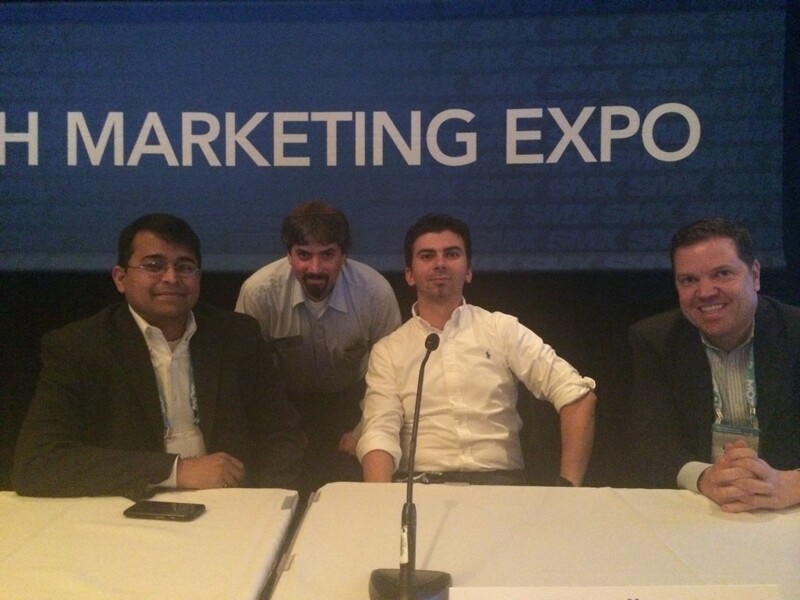 From left: Mitul Gandhi, Barry Schwartz, Gary Illyes, Bryson Meunier. According to Illyes, the Internet is transforming into something more beautiful. Eventually, it will be in our life 24/7. We are almost there, and yet we still have website issues yet to be solved, namely the general unfriendliness of some mobile sites. Smartphone penetration is increasing and Google wants users to be happy. 67 percent of people use their mobile phone every single day. What are they doing on their phones? Browsing the Internet and visiting websites. Since Google wants users to be satisfied, Google introduced the term “mobile-friendly.” It’s so important to Google, they went on to create the “mobile-friendly” label. Illyes says that Google experimented with this label a lot, and that Google thinks it has has an effect on the Internet. Users are starting to learn that mobile-friendly is good for them. Hopefully, he says, people are also learning that visiting a non-mobile-friendly website can become quite a frustrating experience. Google will continue its commitment to mobile-friendliness when it becomes a ranking signal on April 21. “It is a very important day,” Illyes said. If a website disallows crawling resources, we will have a really hard time rendering the page and ultimately we may not understand it correctly. Please allow us to crawl all your resources. Don’t disallow resources. If you disallow resources, we will not be able to tell if the site is, in fact, mobile-friendly. Will there be smartphone-specific indexing? Is anything else launching on this day? Is the mobile friendly test site-wide or page by page? What is your favorite mobile design? I would choose responsive design. What advice would you give regarding consistency of content and functionality between mobile and desktop? You want to think about the user. You want to see what will work for them. Test your site with the mobile friendly tool — if it says it’s all right, I’d say go with it. Also, make sure you’re happy with the website. Ultimately, that’s important. Mitul Gandhi, chief architect at SEO Clarity, is up next to dive into data. First, however, he reminds the audience that they should know how many people access their sites from mobile, and at what time of day mobile traffic is most heavy. “Let’s get the obvious out of the way — mobile is growing fast,” he says. In an effort to explore the effect of mobile, Gandhi took 450 of his clients’ domains, totaling 7.6 billion visits between January 2013 and December 2014. What did he find? A 400 percent increase in traffic from mobile devices via organic search, and a full 30 percent of traffic was from mobile devices. Don’t count out desktop just yet, though, he says. It’s still vital, it just isn’t growing as fast as mobile search traffic. While mobile increased by 400 percent, desktop traffic still increased by 100 percent. Our third speaker, Bryson Meunier, is the director of SEO for Vivid Seats, a company that facilitates the sale of concert tickets. He’s been experimenting with mobile-friendliness. There is more than one right answer when it comes to mobile friendliness, he says, pointing out that more people use mdot mobile sites (m.websiteURL.com) than anything else. Vivid Seats itself is using dynamic serving and deemed mobile friendly. Responsive design is not the only choice, he says. More than half of Vivid Seats’ traffic come from smart phones alone. All of their competitors have the mobile-friendly label, so it was a “no brainer” for Vivid Seats to really invest in improving the mobile experience. 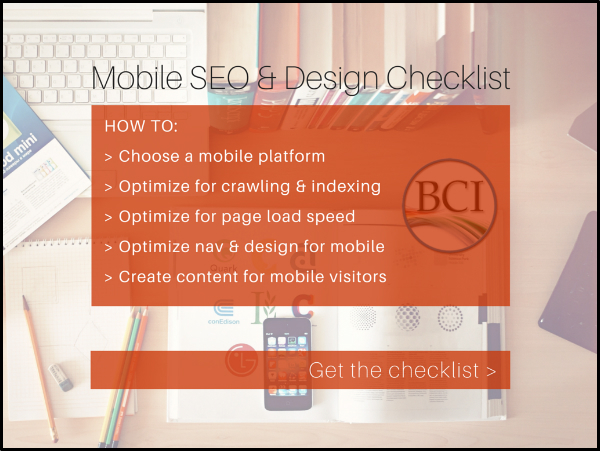 Meunier looked at the data to determine if fixing mobile usability errors help with SEO or user experience. The conclusion? Fixing mobile usability errors has no immediate effect on traffic, revenue or bounce rate from mobile search traffic. Which means, according to Meunier, no apparent mobile usability algorithm exists as of February 17, 2015. He said that if a mobile usability algorithm does exist, it may not be worth the effort. Meunier will continue monitoring to see if there is, perhaps, a delayed effect. Great post Kristi- I think a lot of people fear April 21st as though it is the apocalypse but it really isn’t as scary, Google is just trying to make things better. There is something i was curious about however, is the new change going to affect searches on mobile alone or is it going to alter desktop searches too? Thanks for sharing insightful post !